Your goals will help determine the content you should include in your Facebook calendar. Building awareness requires more frequent posting. Product promotions may happen infrequently. And you may want to ask fans questions on a regular basis – it’s proven to be one of the best ways to get fans engaged on Facebook. More on that in a moment. So let’s assume you know why you’re on Facebook. Now for the what. 1. Determine your posting schedule. Is it twice a day, weekdays only? Once a day? Are you including weekends? 3. Consider whether you want to include recurring topics and themes. As with blogs, you could set up various days of the week for specific topics or coverage areas. For some clients I’ve done media clips once a week on a specific day, for others I’ve included a video once a week – the brand’s or a link to another video that was relevant and timely. Block out these recurring topics in your calendar. 4. Be sure to include a mix of media in your posts. You can post links to outside content, photos and videos; you never know what will catch a fan’s eye, so experiment with various content types at various times of the day/week to see which ones generate the greatest results. 5. Don’t be overly promotional, but don’t forget that you have brand goals for using Facebook in the first place. Look at your overall marketing calendar to see if you can use coupons, marketing promos, sales or other events in your Facebook content. Consider creating specials just for your Facebook fans. But keep in mind that Facebook’s Terms of Service are pretty specific about how you can market using promotions, so be sure you’re staying on the right side of their terms. 6. Find ways to make your posts interactive. Ask questions. Create polls. Be open to feedback. From my client experience, I’ve found that an open-ended question can generate as much as 200% more interactions than a statement. 7. Write out as many posts in advance as possible in your spreadsheet. Use your themes/topics and marketing calendar to guide you. While you could write long(ish) updates on Facebook (420 characters is the max), the system cuts off posts that are over 320 characters and adds a “see more” link which requires an extra click from readers. So try to be brief, unless you need to communicate a lot of details about something special. 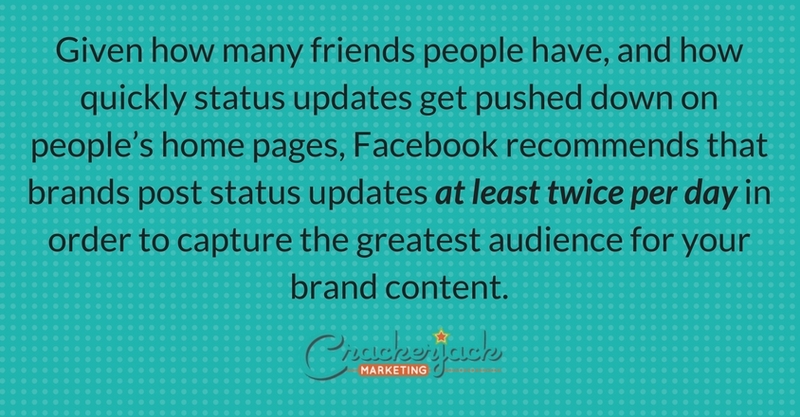 Did you know that there are effectively two kinds of status posts in Facebook? There is a “status” post, which can only be text or a text link (you can’t use Facebook’s linking feature), and which stays at the top of your fan page until you write a similar post. And then there’s a “publisher” post, which can include links, video or photos, and which shows up on your fan’s walls but does not stay at the top of your fan page. Here’s an example from the Gap fan page. I recommend that you think about what you want to keep at the top of your page and build those updates into your content specifically. From the Gap example, if there’s a link to a hot product you want to keep front-and-center, use a text link in a text-only update. But if there’s an event which is time-sensitive, or a promotion that may not last, create links using the Publisher link option in the status box, which will give it some graphic “oomph” and allow it to move down the wall as you add new updates. There are a number of third-party resources which can help you manage your Facebook page, including scheduling updates and moderating comments. Many will also let you share this responsibility with a team. A few to check out include Context Optional, Buddy Media and Involver. There are also free tools such as HootSuite, but HootSuite only currently allows posting of text-only updates, not media-rich publisher posts (as described above). None of the more robust Facebook management tools come cheap, so consider your staff resources when putting together your editorial calendar as you may need to have an actual human doing your posting every day! What’s in your toolbox for keeping your Facebook page fresh? Please share your tips and tricks in the comments.